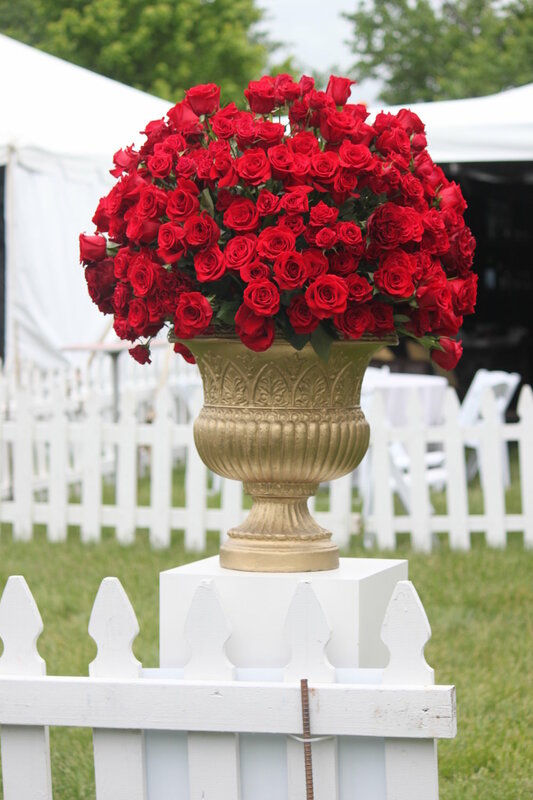 Red roses in gold vases, handmade "tree" stands, Preakness-inspired florals for a local fundraiser and floral design students creating European hand-tied bouquets - that’s the definition of fun at J. Morris Flowers. May was a very exciting month in our Leesburg studio and we took the good times on the road. My team and I loved traipsing around Northern Virginia with vans full of flowers for Mother's Day and the special events in our communities. And the weddings... we worked at so many of our favorite venues this month and were amazed at what we achieved working side-by-side with our creative brides and grooms. Here’s a few highlights from the month of May at J. Morris Flowers. We really enjoyed partnering with the team from Airlie in Warrenton, Virginia. 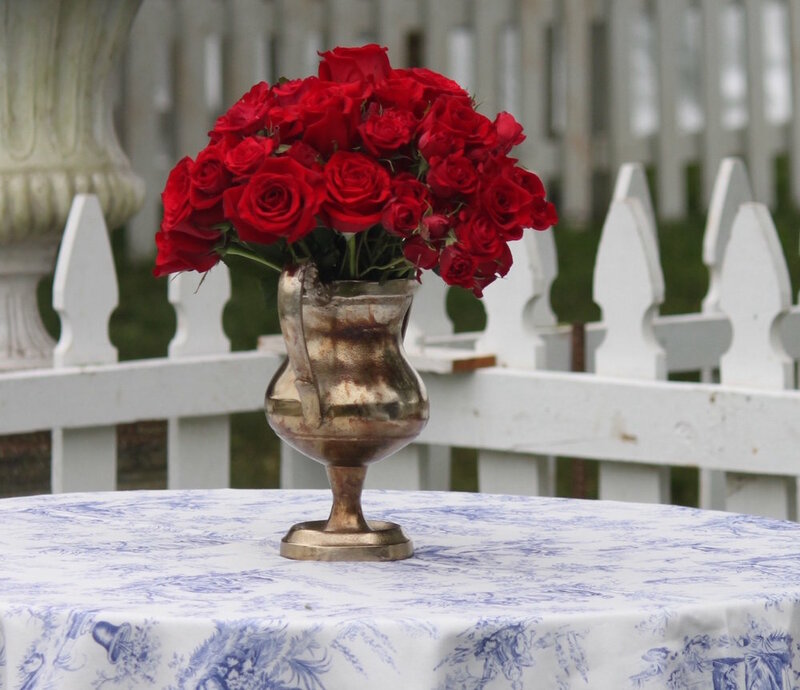 The inspiration for their tent space included navy toile, racing style gold cups, vases and urns and deep red roses. 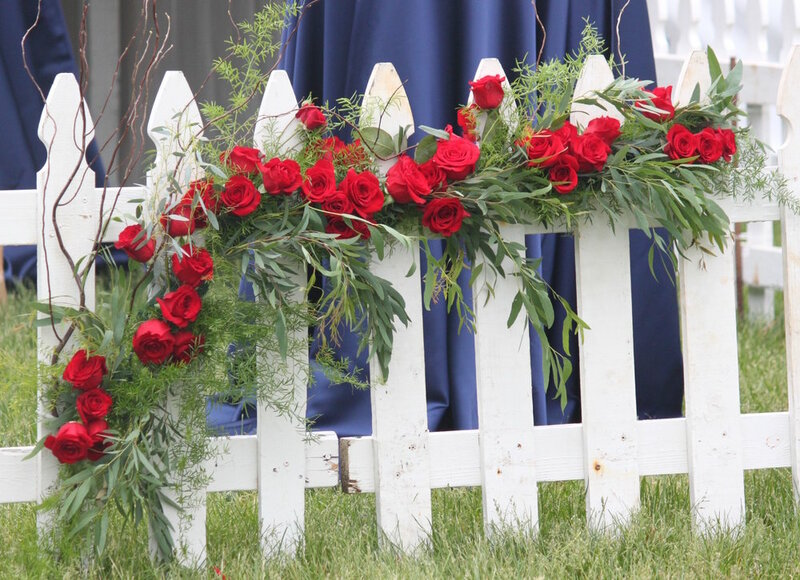 We used more than a thousand red roses in three different varieties including Hearts, Freedom and Spray Roses in a mounded but textured design style. The overcast day and the white tent created the perfect backdrop for the brilliant reds. Carlos and Heather left our studio at 5:30 am to set-up and just loved the pre-event energy at the Cup. Carla and I spent the afternoon with the Airlie team dodging rain and watching races. We made so many new friends and extend special thanks to Quaid Coxley at Airlie. I teach eight classes per year, each class focusing on different techniques, design styles and floral varieties. Honestly, there’s something really special about teaching someone how to design an arrangement in their own hand. The expression "hand-tied" should be taken literally. Your hand becomes the armature and temporary vessel during the process until you are ready to tie-off the design with a little tape and ribbon. The members of the May class did an amazing job and two or three of the women were attending for the very first time. We used Baronese and Juliet Garden Roses, Sweet Eskimo Blush Pink Roses, Ivory Spray Roses, Burgundy Ranunculus, Spirea and Silver Dollar Eucalyptus. Each year, we provide event florals and décor for five local organizations who so thoughtfully serve the members of our Loudoun County communities. Therapeutic Riding is such a wonderful way to inspire children and adults who deal with psychological, physical and cognitive disabilities and we are so fortunate to have a thriving organization right here in Loudoun County. This kind of "hands-on" therapy builds strength and confidence and we love to hear about the connections that are formed between these incredible people and generous animals. We used sunflowers to support the organization's Preakness-themed gala, surrounding the blooms with beautiful white Stock and Lisianthus in rustic wooden boxes. Here's a link to Loudoun Therapeutic Ridings facebook page for more information. Looking for an alternative to a glass pilsner vase for your rustic, woodlands or bohemian themed wedding or event? We have just the thing for you. Hand-made bases fashioned from wood slabs and birch branches constructed right here in our studio in Leesburg. The stands were made for a bride and groom who had their wedding Saturday night at Breaux Vineyards. The stands are created so that our designers can work in foam in a lomey dish secured to the top wooden slab. The bride used purple, lavender and white flowers and linens, lovely colors for that natural vineyard setting. 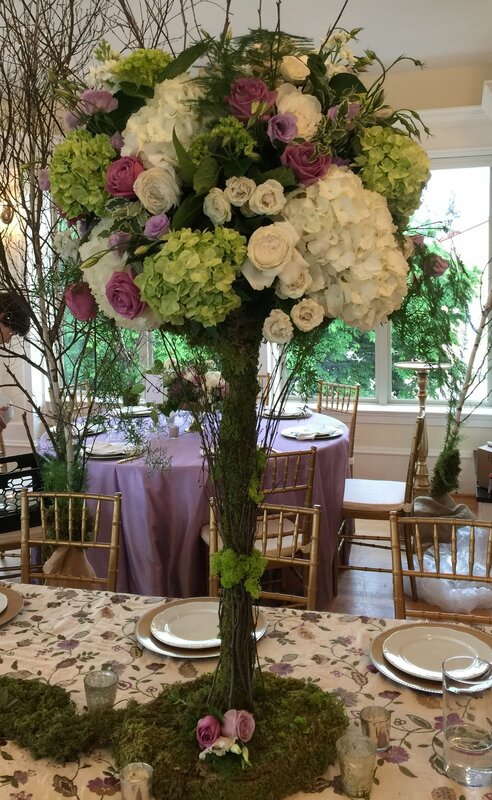 The tops were lush and full with a variety of Roses, Hydrangea, Ranunculus and greeneries. Carlos made them tall enough so that they would not interfere with conversation and table talk. Fifteen birch trees with fairy lights surrounded the room transforming the already gorgeous space with a glamorous, woodlands quality. We have our last class of the spring on Tuesday, June 6 at 7:00 pm (classes resume in September) but we have some big things coming up this summer including our move to historic downtown Leesburg! Stay tuned for details.